I remember picking up an early issue of SLIDE Magazine and on the inside cover was a full spread of Roger carving on a retro twin fin. It stuck in my mind , and as an integral part of any surfers journey through design I wanted to connect to that feeling. 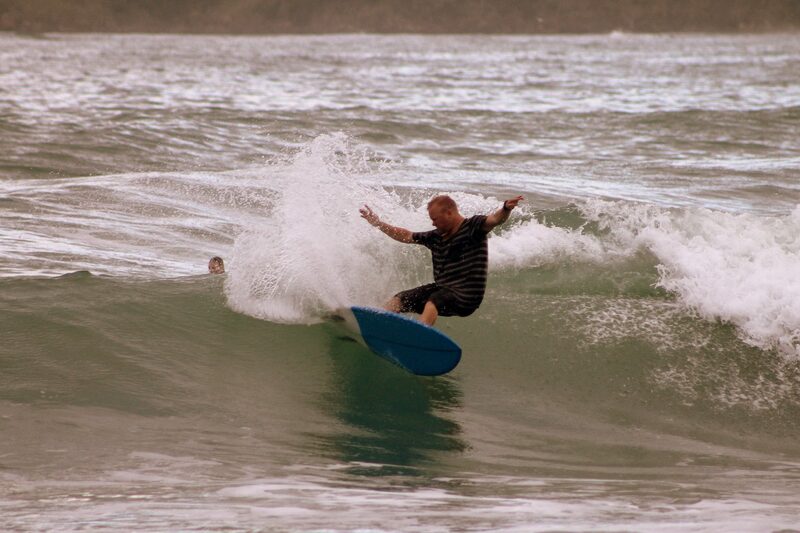 I have been lucky enough to surf some of Roger’s early twin fins along with a bevy of other similar styled boards. 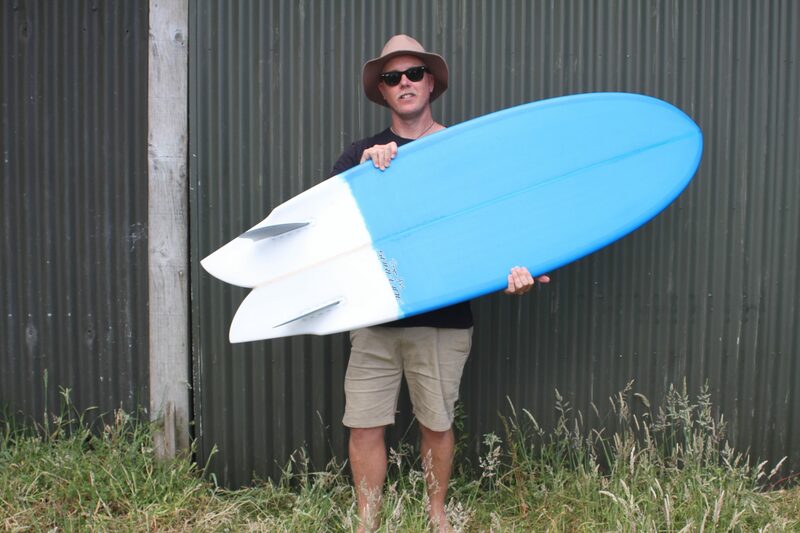 It was a natural progression to include a Twin Fin into our 4 Board Quiver project. One of the things I love about working with Roger is when we catch up and discuss boards, afterwards he goes away and really thinks about it and the idea starts to come to fruition. I’ve been lucky enough to have access to the Demo Fleet in the Candy Store and had ridden a number of different fish type boards including the Twin Keel Fish and the C-Wing Twin Fin. I was intrigued by the C-Wing design and the potential lift it would provide when gliding down the line, and after Roger told me about the “magic” that happens with a C-Wing under your feet we settled on a 5’9”. It was a revelation! I could surf it in anything from 1ft to 6ft grinders breaking off Head Rock, and the speed and maneuverability of this board surpassed any twin fin shape I have ever ridden. For me it was the transition between short and longboard and the freedom of 2 fins that has allowed to explore the speed and flow of the C-Wing. Days I would normally wax up more HP Shortboard I was going for the C-Wing instead, in fact it was basically the only board I rode for 6 months (plus the odd Log sesh in between). Roger has the ability to hide volume in boards without it impacting on the overall performance of the design. My 5’9” had a lot of volume across the chest area which increased paddle power, at the same time the rails were nice and refined allowing me to really put the C-Wing on rail. There is something magical and mystical about riding a Twin Fin, nostalogic in the sense it was a popular design in the 1970’s, but more so the sense of being able to really let go and feel the wave under your feet, with the freedom of 2 fins to glide you through the arcs. I now have a C-Wing Mk2 version, same length and volume, slightly more refined , “Retro Orange” in colour. It’s a magic board, and in the true spirit of surfing, a board every surfer should explore at some stage in their surfing journey. 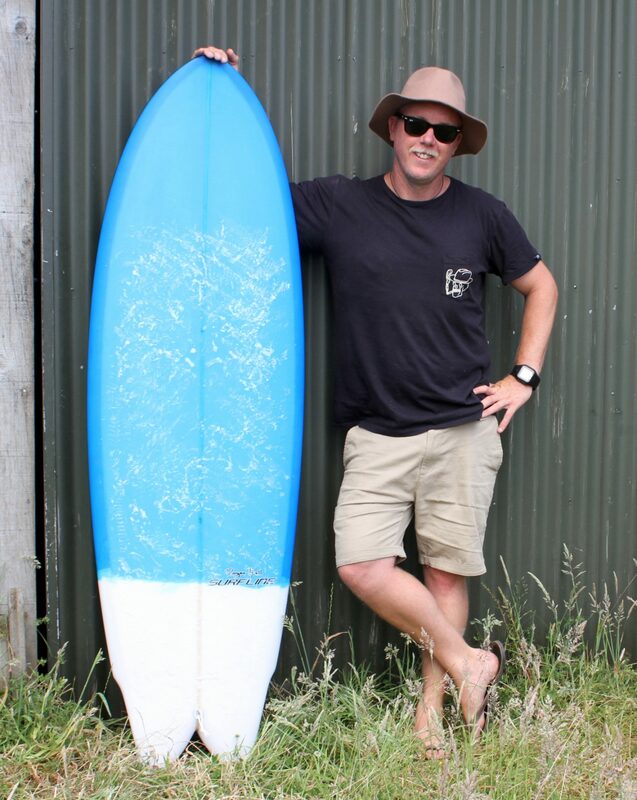 Hi Robbo, Great to hear thanks for the feedback, nice to have a custom board that you like riding and also like the way it looks. That Comp Deluxe model will serve you well for years to come . . . just mind those rocks! 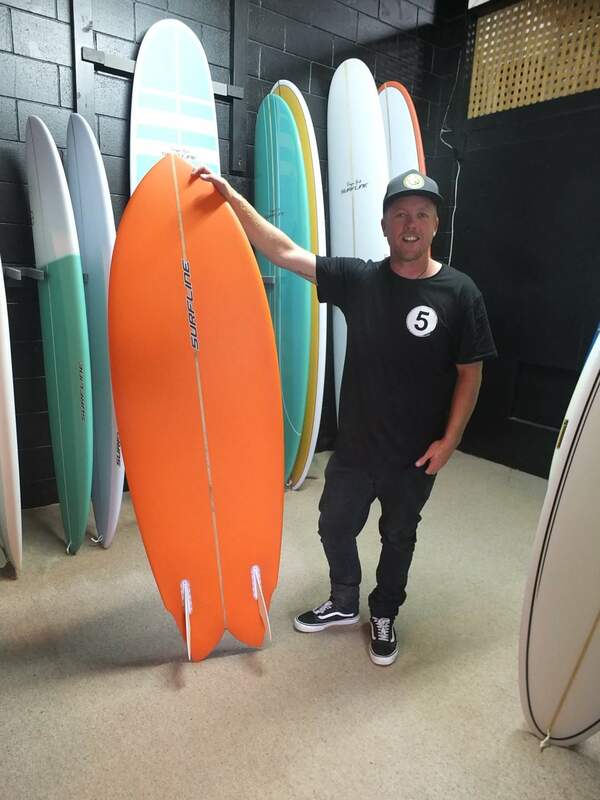 Love mine too , took a little bit adjusting to it at first & thought it was a fun kinda board … until I surfed it at a long running point break that was overhead & firing! That particular session sealed the deal for me , fast , flowing arcs with no loss of speed & flow between transitions , as well as feeling in control . You can put your trust in it when you put it on rail also as it holds in & carves. Top shape ! Thanks Shane, I like the way you “discovered” the shape, liking it at first and then surfing it in conditions that allowed the design to shine. That Concaved wing certainly adds a lot of depth to the feel of ride. Very dependable yet in an exciting way! Cheers, Roger.